So, my order from UC Press’ big online sale arrived today. Admittedly, after reading “Cheap – The High Cost of Discount Culture,” I keep trying to figure out if I should feel guilty for buying them on sale (especially with a number of them published in, of all places, China). Oh, well, they were purchases I was (mostly) going to make anyway, so what the heck. Of course, life is all about balance, so to make room on the shelf for my new books, I have a small stack that will be heading to the donation bin at the local library. Wax on, wax off. Yep, five of the Natural History Guides. I’ve even already read the one of SF Weather which, surprisingly, informed me quite a bit about how weather works in the Los Angeles region. Yea for more random knowledge! “San Francisco Bay: Portrait of an Estuary” was something of a lark. I figured it would have good photography, which it does, but it also has quite a bit more informative text than I was expecting. I’m rather looking forward to reading it. “Yosemite: Art of An American Icon” was actually the book produced for an exhibit at the Autry National Center back in 2007. I rarely buy exhibition books, mainly due to price (the hardcover was $65, the softcover $35). During the sale, UC Press was selling the hardcover for $10. Ten dollars. Who am I to pass up such a deal on a book about a place I love anyway? 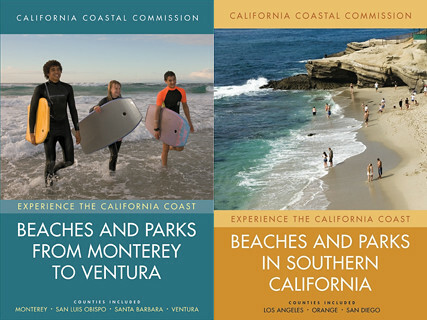 These two books weren’t really necessary purchases, as I already own the California Coastal Commission’s “California Coastal Access Guide”. Still, I don’t regret picking them up, since the books provide a wealth of information regarding the local coastline. Each part of the coast is covered, showing parks and facilities (i.e. picnic areas, campgrounds, etc. ), as well as sidebar articles on various aspects of the area (i.e. history, natural environment, etc.). For any Californian these are a welcome addition to the bookshelf. 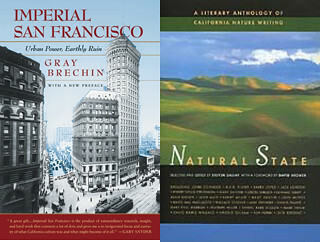 “Imperial San Francisco: Urban Power, Earthly Ruin” is a book that’s long been on by to-read list. The reason for this, I think, is because it’s so, so much more common to criticize L.A. than S.F. There are shelves of books on all the things wrong with L.A., but S.F. always seems to be held above the fray, as if it exists on another level. This, of course, isn’t true: S.F. is just a much a cancer on the landscape as any other city. After all, its primary water supply comes from a dam and reservoir built inside a national park. Earthly ruin, indeed. “Natural State: A Literary Anthology of California Nature Writing”, on the other hand, contrasts the work above, consisting of over three dozen short works by authors such as John Muir, John Steinbeck and Jack Kerouac on the beauty of California’s natural environment. I picked it up for a couple of reasons. One: because, as we all know, I love my native state, especially its wilderness areas. Two: I think it will be nice to read what others have written about California in short pieces. Maybe, just maybe, as a side benefit, my own writing about my home will improve as well. As a totally random side note: with all this serious literature on my shelf, I’m thinking I should look for something fun next time I’m down at the library. So, what’s the funniest book you’ve ever read? Recommendations? Looks like you got some really good deals. I am about to point my mouse over to the UCPress website… A funny book that I think you’ll enjoy is A Walk in the Woods by Bill Bryson. It’s about his attempt at an AT hike. That Yosemite book looks GORGEOUS. Oh, and “Yak Butter and Black Tea” is a very entertaining and memorable read. The only book ive read fully twice. cmacc read my mind; that yosemite book looks amazing. as for funny books, the first thing that popped into mind was david sedaris, especially Me Talk Pretty One Day. Sounds like an interesting shelf you got there. I could see myself reading them. I try to mix fiction with non-fiction just to keep things fresh and lively. Don’t have any light reading to recommend though. Most of my stuff is more serious. If I come across something, I’ll pass it on to you. Oh, don’t read “The Road” if you want funny. For laughs, I read Laurie Notaro’s I Hate Everybody and Other Atrocious Lies. Even men I know think that book is funny. You can borrow my copy if you like. Maybe not the funniest book I know, but if you like fantasy adventure books, I recommend the Redemption of Althalus by David and Leigh Eddings. Can you recommend some good weather books for me? Homer-Dog – I don’t read nearly enough fiction. Thanks for the advice on what not to read, that’s just as good. I like anything by Orson Scott Card – I categorize his work into three areas: (1) overtly religious (Alvin Maker series, Lost Boys) (2) Ender (ender’s game, speaker for the dead, etc) (3) other (Enchantment, Pastwatch), The “other” stuff is good, as are the early books in the Ender franchise. For category (1) I think you really have to be in the right mood. In the vein of philosophical sf, “Enchantress from the Stars” by Sylvia Engdahl is great. I forgot about the Eddings books. The Belgariad and Mallorean pentologies are good reading if you like fantasy. His later stuff was pretty sad though. By the way, the Road is a good book, it’s just not happy. When I was a kid, “Bored of the Rings” had me and my older brother laughing so hard we could barely breathe.